Do you remember the Tea Leaves Up Close post I wrote with Bellocq's White Nixon as the subject? Not only did I photograph the tea (with my Photojojo Macro Lens), I've also drunk the tea, many times. Here's another plug: I got my White Nixon at the Bellocq Tea and Cheeses of Europe pairing at the French Cheese Board. White Nixon is Bellocq's tea No. 29. 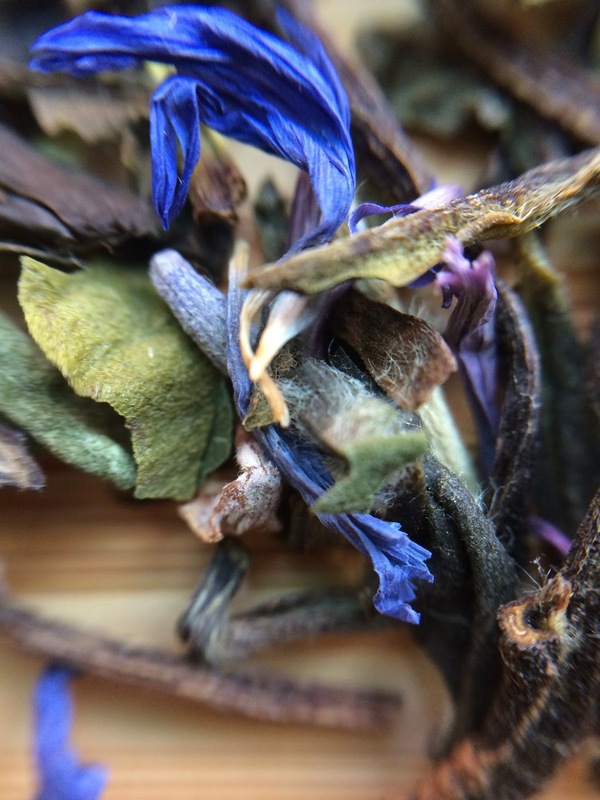 It is a white blend with a White Peony (Pai Mu Tan, Bai Mu Dan) as the base with lavender and cornflowers. You notice the hairy buds of a classic Bai Mu Dan. The flavor of the liquor has classic White Peony notes, too, plus lavender. Don't think of a perfume shop. Instead, recall brushing past a lavender plant in summer and the release of the oils which almost imitate a juniper or pine. I'm not sure I taste the cornflower but it is pretty to look at.